So I would have had actual photos for ya'll, but I had a string of bad luck this morning, so I had to leave without taking any. In the meintime, thought I'd post an example of my raging OCD... Basically, to prevent myself from going overkill and just never stopping, I have to chart out my collections pretty heavily to establish limits to my raging insanity. I may have posted this chart before, but eagle eyed people might notice I swapped out Agent Venom for Space Venom... Mostly because I was buying the whole SV wave anyway and it didn't make sense to then buy a separate version of the same character. In other news, I've already started painting Black suit USM, right now I've just gotta rework the head and add the chest symbol. I'm kind of annoyed that I ran out of time to take a quick photo, it looks so good already. Need to set up my shelf for the current group shot, but here's USM as he currently stands. I'm waiting for the the sculpt to finish so I can sand down the eyes and finish painting the head, plus do some quick touch ups to the paint job, but I think he's coming along fairly nicely. Much better photo this time, not with the mask as well. I'm actually still doing touch ups there (mostly just cleaning up edges) but he's mostly done, at least until I get the logo decals. So right after taking a whole bunch of photos of the shelf, my ipad dinged, letting me know the packages containing Hammerhead and Kraven the Hunter were delivered. So I was like "welp, so much for those photos" and ran down to go pick those up before the PO closed for the day. The successive batch of photos was not great, especially since the lamp is just to the left of the frame, but... eh. 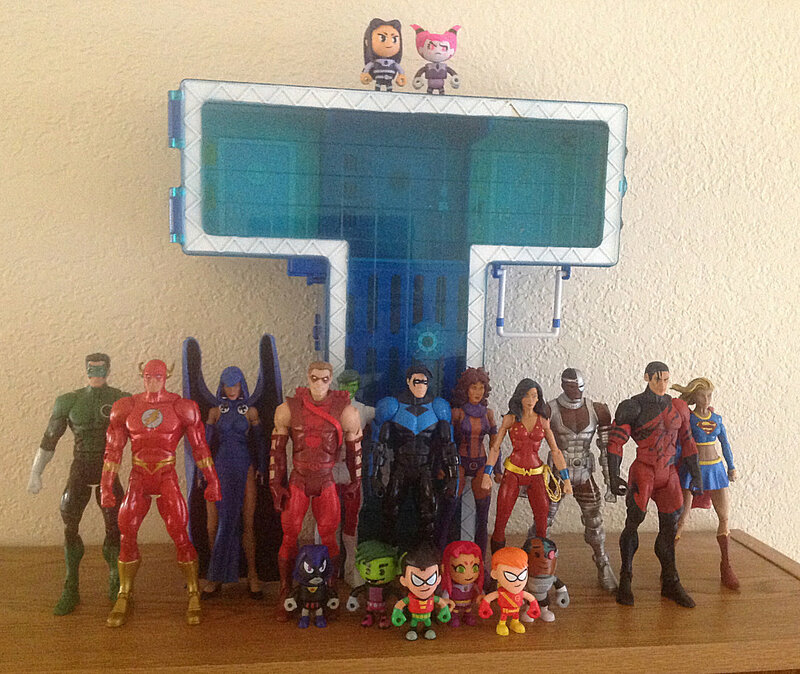 That is one impressive collection of spider-characters. So after torturing myself over some of the recent (and not so recent) reveals, I finally broke down and restructured my list so as to incorporate some of the characters I had/wanted to add. 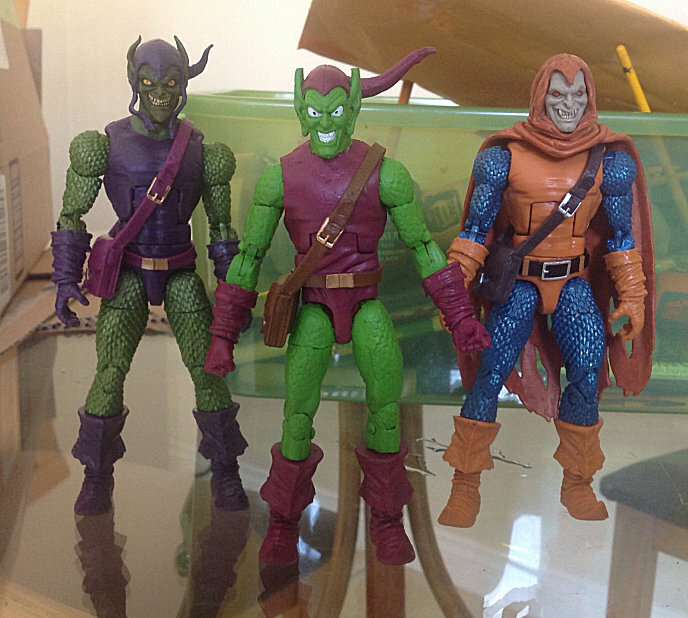 Yes, that is an unfinished Ricochet and a headless ML8 Green Goblin. 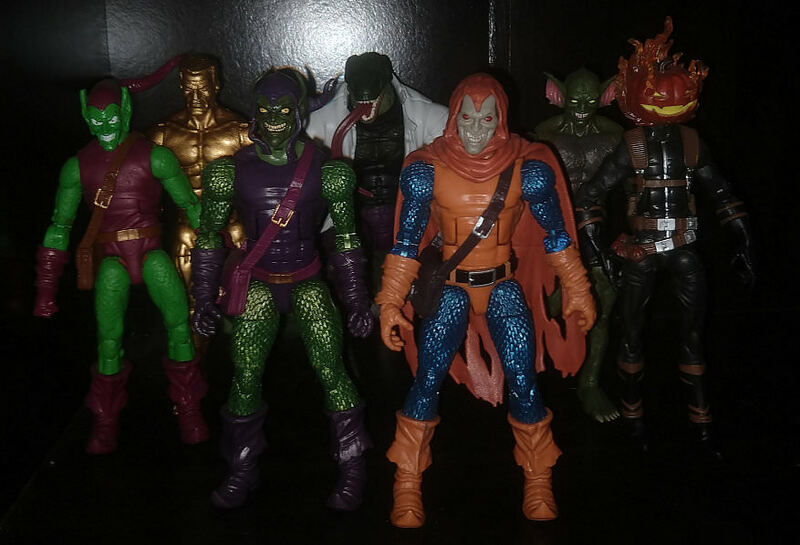 The former will need some new pieces, and the latter's head will be stuck on a Spectacular Spider-Man body spliced with GG/Hobgoblin pieces for a Harry Osborn custom (I wanted the ML8 Goblin head since that's far closer to the classic art than the more modern Sandman wave GG). Electro is handless because I'm giving him some spare hands because the lightning ones weren't great. 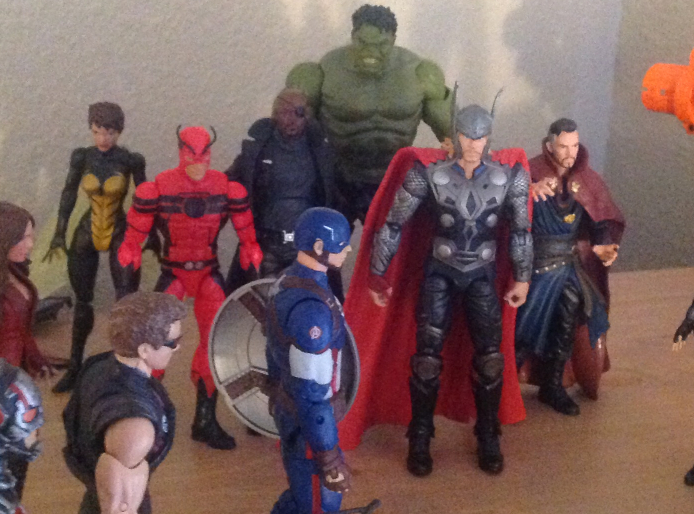 So today I got some new additions to my MCU shelf, and since I was taking new photos of some of my old collections anyway (recently joined a forum for DBZ figures), I snapped some pics. 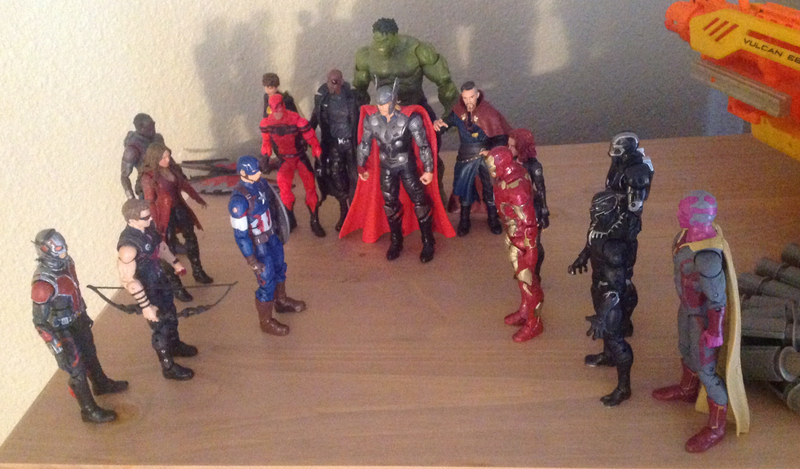 Edit: Also, before I forget, I DO have a special space that's already home for the FR figures. I'm just not sure where one or two are at the moment (bubble wrap: Great for keeping figures safe during moves, not so great trying to find them amongst other bubble wrapped things.) so I'm waiting to take the photo until they're out. 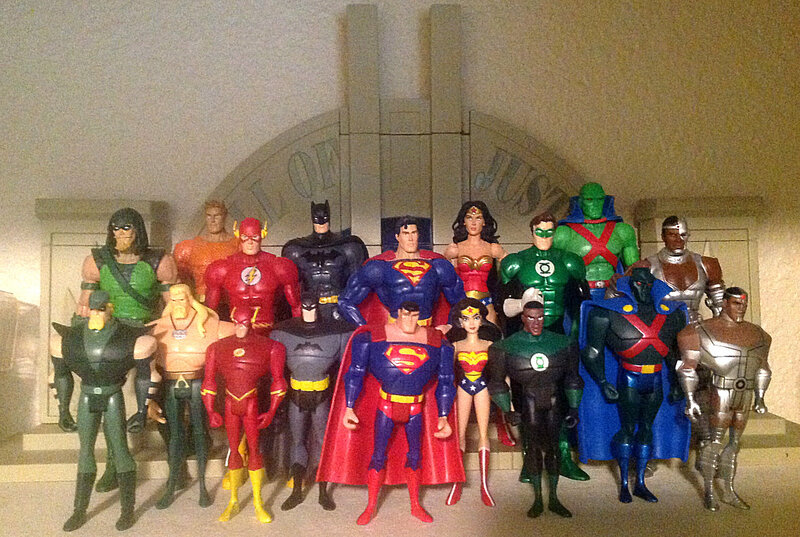 Sweet collection. 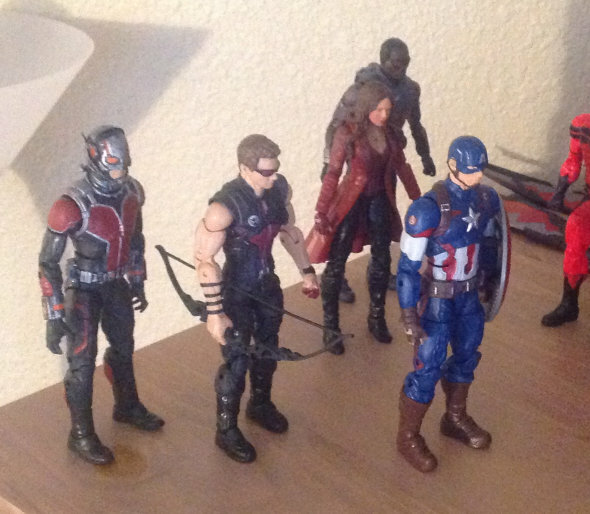 I was actually really close to picking up some GotG figures today. Is that Piccolo posable? If it is I'm really impressed to see a figure that can cross it's arms like that. What they do with the figuarts figures (which is where that figure comes from) they're made for collectors, so they have swappable faces, arms, hands, etc. For the crossed arms, they're actually molded that way as a separate attachable piece, because there's realistically no way to do it otherwise with hard plastic. That said, there are apparently Dragonball figures that have flexing biceps now. So that's a thing. Envy. I used to have so many (think I mentioned I worked at a toy store) but really loved the Spidey stuff. The design just lends itself to figures so well. My favorite line was probably Along Came A Spider followed by Planet Of The Symbiotes. I also love the Deep Sea Venom for some reason. Speaking of I've been extracting models from Spider-man Unlimited and uploading them to my Deviantart account all week. Should have almost everything up by the months end short a few that came out broken. Spider-Ma'am was the first I did as I thought I recalled you asking about that one. Envy your Mario stuff too. I've had a desire to buy a lot of the small plush World Of Nintendo ones. Sort of waiting for them to go down a buck or two. I have the Toad in Catsuit one though, he hangs out on my bed with with my Harley Quinn plushy lol. So I've talked a bit about this before, but I'm a bit more of a fan of Harry Osborn as the Green Goblin than I am of Norman in the role. While Harry had died by the time I was 4 years old, I grew up on my dad's back issues, and I loved the complicated history between Harry, Liz, Mark, Peter, and MJ. Harry's confrontations with Peter just seemed much more... personal than they ever were with Norman, especially since... well, let's face it, aside from the secret identity thing, Norman really had nothing to do with Peter's life outside of his dealings with Harry. Harry ALSO knew Peter's secret identity, but there was also personal torment because he was also Peter's friend. And they've TRIED to do some weird father-son dynamic with Norman and Peter since his resurrection... but to me, it just wasn't as strong as what we'd gotten with Harry. So I recently finished a few customs, thought I'd post them here. About freaking time. Been working on these guys off and on for two years now. 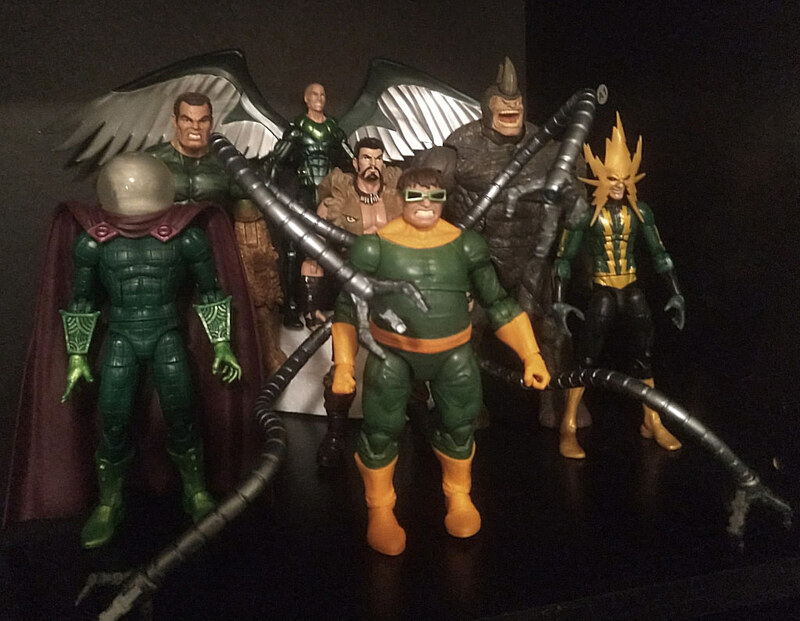 For those who don't remember, these are VERY loosely based on the Enforcers of the Spectacular Spider-Man cartoon... With outfits that don't annoy me. This was something I decided to do more or less on a whim (hey, what if instead of having Brock venom, Brock Antivenom, and Flash Venom, I just do Brock Venom and Flash Antivenom. Shouldn't be too hard right?) and spiraled out of control. I'm happy with the result though. 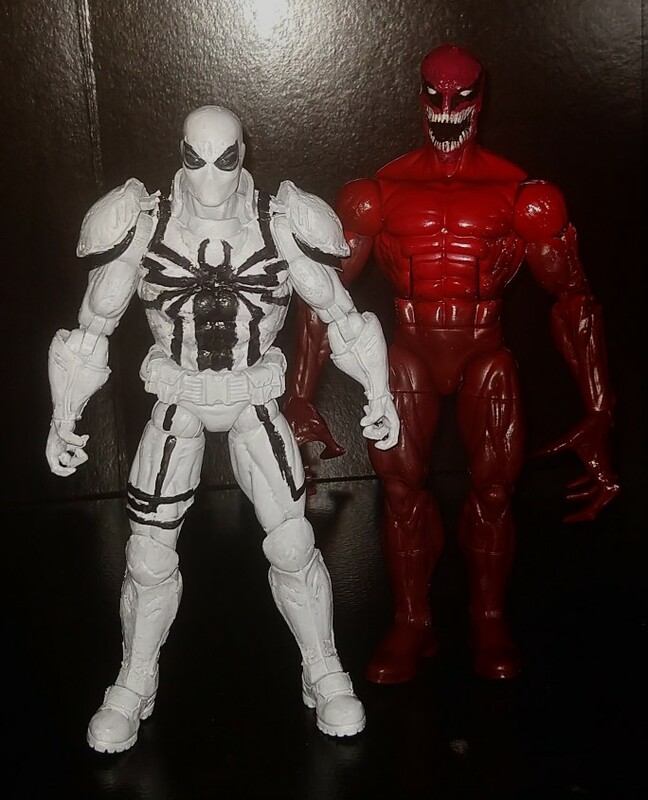 Next to him is a modified Toxin... Not much to say there, the figure was meh but the original head was just derpy looking, so I repainted the Brock Antivenom head and it looks much better. I've already told you DJ, my figure shelves get dirty enough without adding in a pile of decaying goop. Though real talk I did spend some time a few months ago trying to find your avatar skin and I might legit have a decent base figure for a custom based on what I remember of it, but I never did find a DL and even if you sent it RN I couldn't guarantee I'd do it right away given what I'm about to talk about, but I would like to at some point if you want to send me a PM. 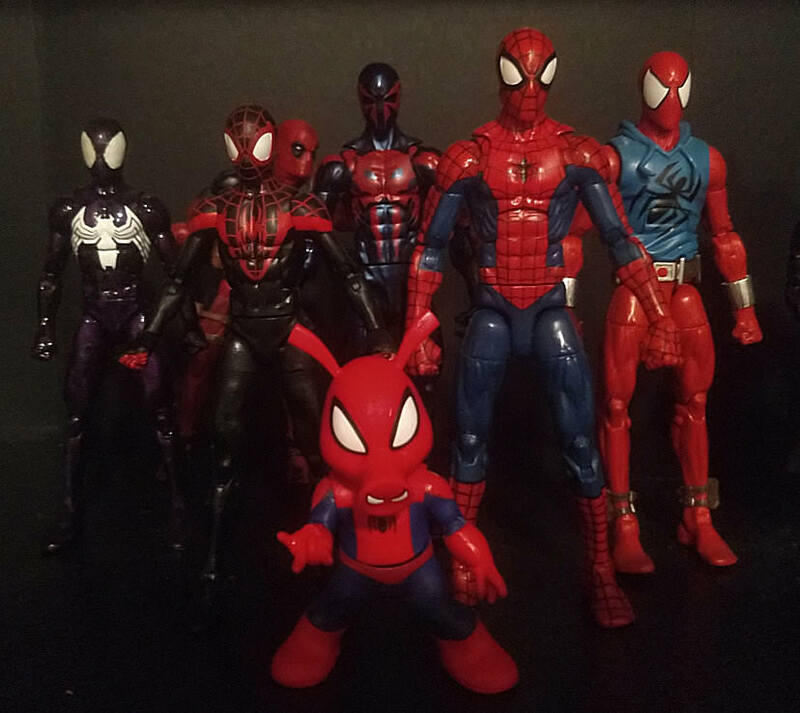 Anyway, so as of this afternoon's completion of a Scorpion custom, I'm about 88% done with my Spiderman collection (which I will post later, decided to take new photos and have to edit them all). It's... actually kind of surreal for me, since I usually don't achieve collection goals and in fact have been scaling back most of them for awhile now to make them more obtainable. 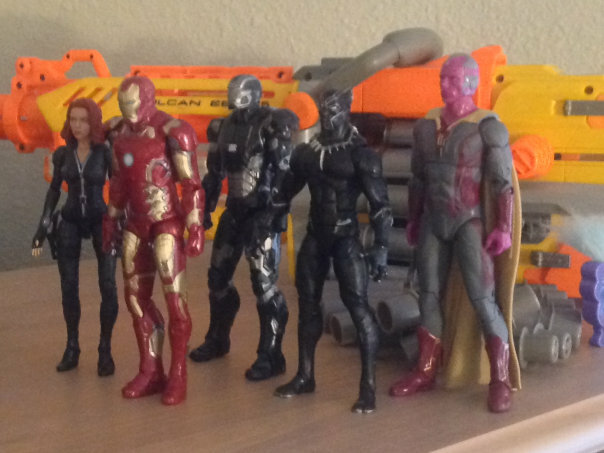 Granted, some just don't have an end (the MCU shelf will continue evolving as the MCU does, for example) but it's nice to, FOR ONCE, finish a collection I planned out. It makes my OCD happy. That said... 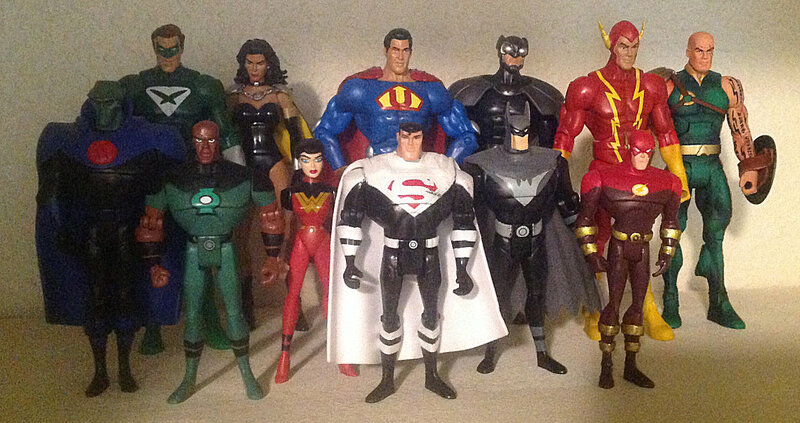 I was hoping to discuss a few gaps I still have in the collection, since I'm super wishy washy on their inclusion. 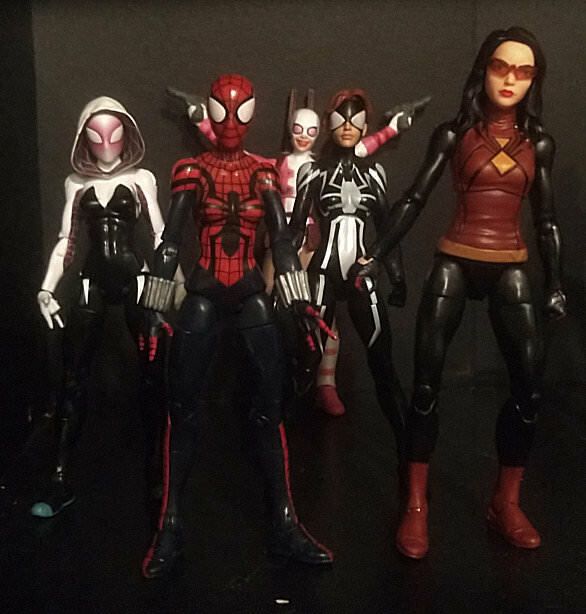 I'm currently missing 6 figures... 1 Amazing (aka good Spider-men), 1 Symbiote, 1 Superior (the darker characters like Kaine, Superior SM, and Noir) and 3 Spider-Women*. I'm pretty dead set on the Amazing and Spider-Woman characters I have planned, but the Symbiote and Superior sets... I'm not so sure. I have some characters listed that I MIGHT still resort to, but I'm not positive. Superior- Up until a few months ago I wasn't really that fond of my options, and when I was compiling the list for the shelf I even went so far as to move over Ultimate Jessica Drew from the Ladies shelf to pad it out (and also to have as many spider-ladies as possible). With Spider-Geddon though... I dunno. I like the Spider-Osborn character introduced even if I cringe back from the idea of customizing him (though there are tutorials on the net for a six arm Spider-man I could potentially adapt) but Assassin Spider-man was one of Octavius' inner circle in 'verse and I'm reluctant to remove him even if he does have kind of a boring outfit. 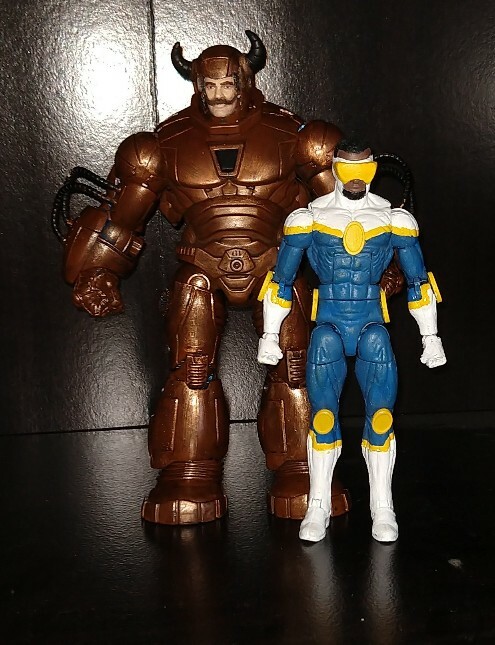 I honestly may just wait and see on this one, since I expect we might get one of them in a future wave and 'Geddon is still ongoing. You would think... with a movie out that I actually marginally enjoyed (not great, but better than I expected) and with the sheer INSANE number of symbiote characters getting figures, that surely SOMEONE would take my interest long enough to get me to purchase a figure, right? Red Goblin- Has a decent figure and the design is at least visually interesting (a problem with 75% of symbiotes tbh), but it's a stupid, gimmicky concept that I've hated since they introduced it. The magic of Norman overcoming the symbiote weaknesses was just stupid, and despite some ok bits the story was marred by a pointless character death, several heel-turning character motivations, and was generally more frustrating than it was worth. Poison Spider-Man- Why did this need a figure? It doesn't help that he doesn't even have a proper wikia page, being relegated to a "list of poisons" while there's a what if story where Peter re-dons the Venom symbiote and calls himself "Poison" and THAT comes up when doing a google search instead. I literally only know about it BECAUSE it has a figure. Otherwise, it's a boring design that looks like a discount anti-venom, who I already customized. No Thanks. Riot- Oh Sony, you tried so hard to make me care, but I really, REALLY don't. Riot is a palette swapped Venom without the symbol to give him any personality. 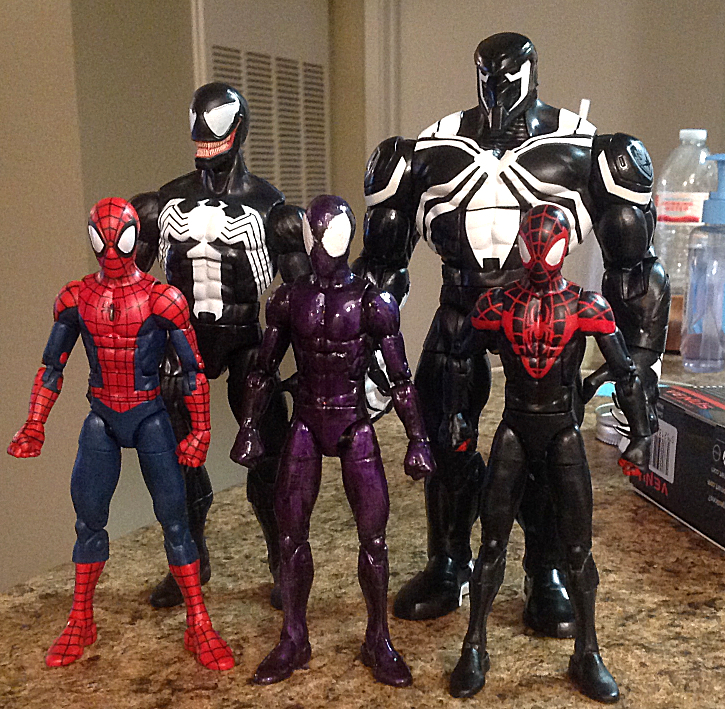 And it's not even a GOOD palette swap, since Riot is dark gray to Venom's black... YAWN. He's such a boring loser he didn't even make it into the wave made to coincide with the film where he was the primary antagonist, and I doubt many even noticed. Lasher- While this one at least isn't technically yet ANOTHER Venom or Carnage variant, and I do technically own it (it was one of the Lizard wave) it's just... boring. The character's yet another of the Life Foundation posse, who all just felt like lame spinoffs even when they were introduced. Scream is the only one to ever really do much in the books, and the Lasher figure is just kinda there. It's a poor repaint of the Spider-man buck, and I already have several better figures on that buck. Plus, Scorpion kinda fills my "green symbiote" quota. 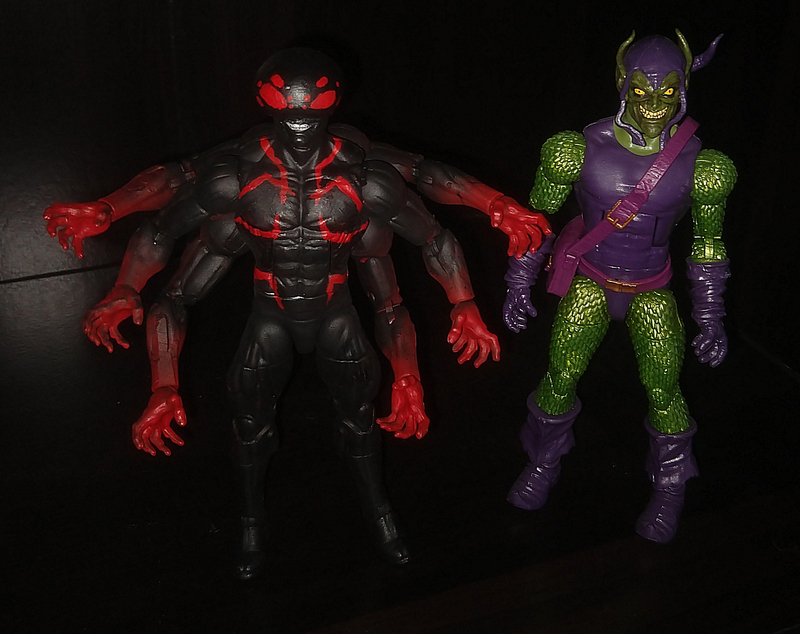 FYI, not listing any of the other two LF symbiotes because they're even worse. Hybrid- So while I'm not fond of the Life Foundation symbiotes separately, of all the options, Hybrid has probably done the most. 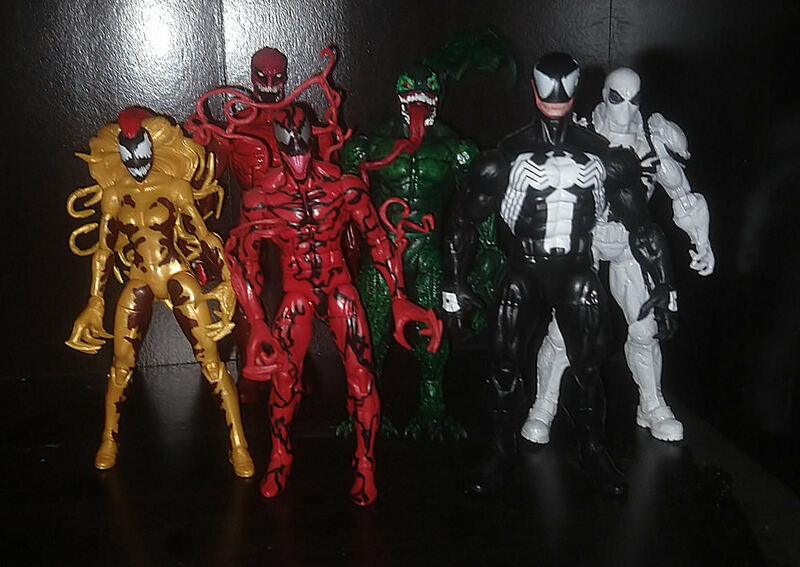 It's just such a shame that a mix of 4 very different looking symbiotes, none of which are red mind you, resulted in yet ANOTHER Red symbiote in a sea of Black/red symbiotes. At least Hybrid Deadpool kept the colors (though I wouldn't include him because DP can never be in a collection, only photobomb other collections. It's a rule I have), regular hybrid is boring and meh looking. Mania/Maniac- The problem with both these options is the same: they're a poor man's Venom and share the exact same visuals we've seen with all the Venom incarnations over the years. Mania at least was a kinda decent redesign of the whole She-Venom idea, but the whole curse mark thing was stupid and without Flash there's not much to do with the character. 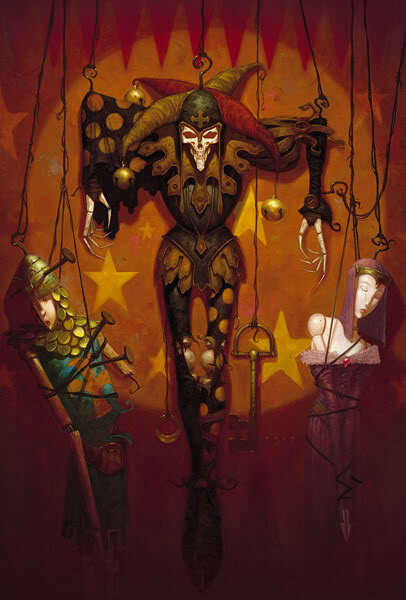 And Maniac... I dunno, I've never actually read the books he's in, but he isn't that interesting visually and what I've read up on him isn't any better. Scorn- Don't like the character too much, but based on visuals alone I tend to give this one a bit more leniency. I'd like a purple symbiote anyway (it's a color that I don't already have, and it would help break up the mass of black and red I've got going on) and the mix of purple and silver is pretty visually striking. That said, she doesn't really have any sort of consistent look, not even the symbiote "hair" we've seen with Mania and Scream. And, again, the character isn't really interesting and was apparently killed in a story about Symbiote god (or whatever, this is why I get so freaking tired of symbiote stories in comics) so bleh. And... yeah. There's a glut of meh to awful options for symbiotes, even with the sheer glut of insane options from eye-rolling events like Venomverse. So I dunno. *As an aside, the fact that we have SP//DR, Red Goblin and Spider-Ham and we STILL don't have Julia Carpenter or one of the SEVERAL Superpowered MJ figures (my preference would be Spinneret from Renew your Vows, but Iron Spider, one of the SEVERAL Spider-woman versions of Peter's outfit, the Carnage one from the USM cartoon... I'd have taken ANY of them) is INSULTING and I'm so salty with Hasbro about that. I'm finally resorting to customs for both, which are at varying stages of completion. Current state of the shelf. Scorpion turned out amazing, so happy with how it turned out. I also have a few wips I can't wait to finish so I can show them off, though I'm still terrified of how I'm gonna paint the outfit on MJ. P.S. Still salty about symbiotes. Huh, didn't realize it'd been so long since I'd actually posted stuff here. Let's fix that shall we? 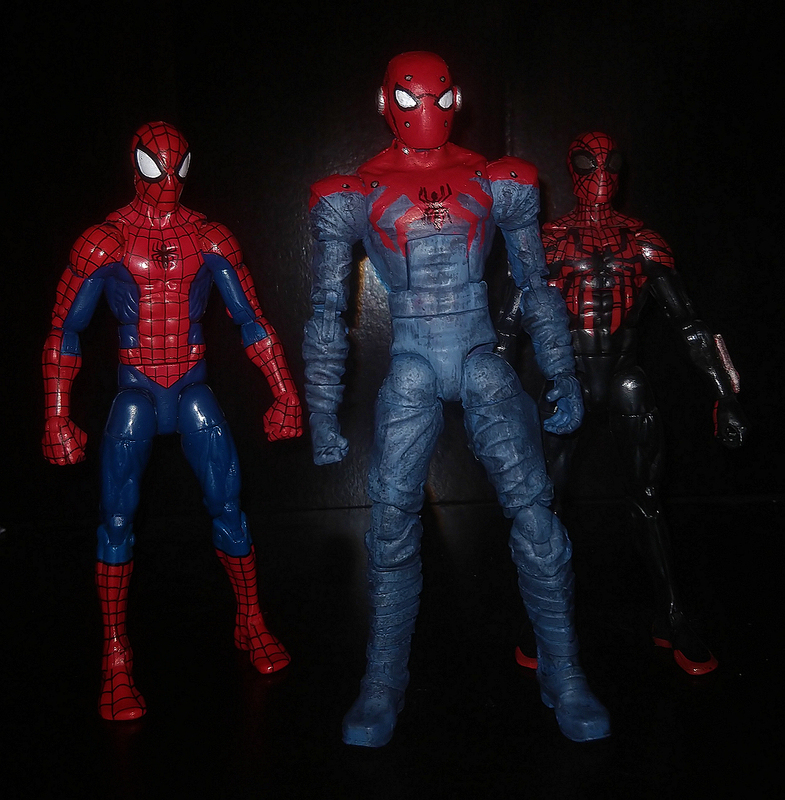 First, finished customs of two Spider-Women, Spinneret and the Julia Carpenter Madame Web. 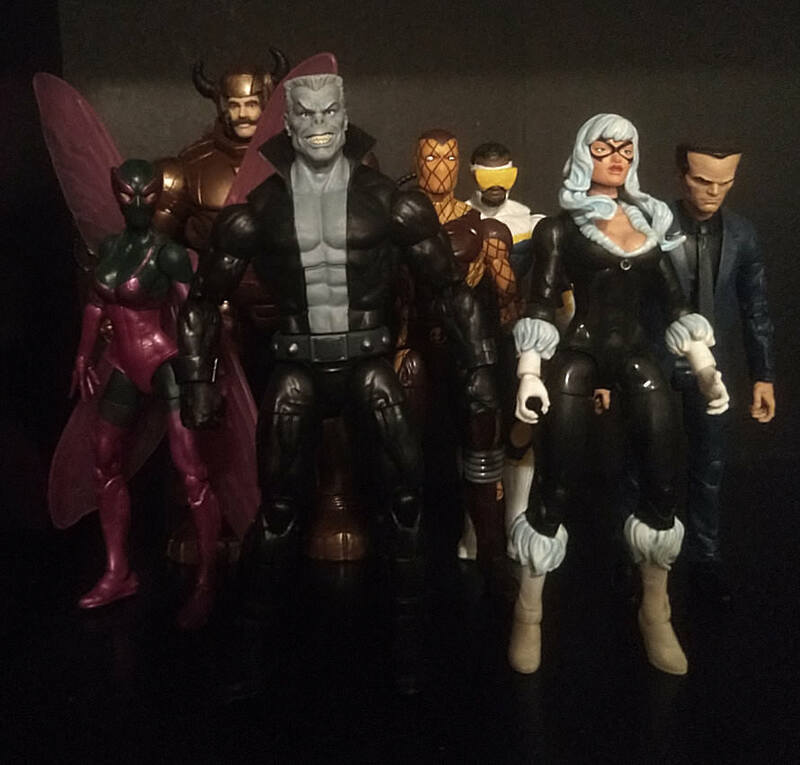 Because Dangit Hasbro, you give us House of M Spider-Man, Red Goblin, and New Black Suit figures, but none of the half-dozen superpowered MJ variations, or ANY Julia Carpenter? I call shenanigans. Whatever, I fixed your mistake (as a funny aside, teh base red I used for the Renew Your Vows MJ was Mephiston Red. Not intentional, realized it after I'd started painting). I've also gotten a significant bit of work done on Uncle Ben Spider-Man from the original Spider-Verse event, which I've posted a few updates of in the Discord. 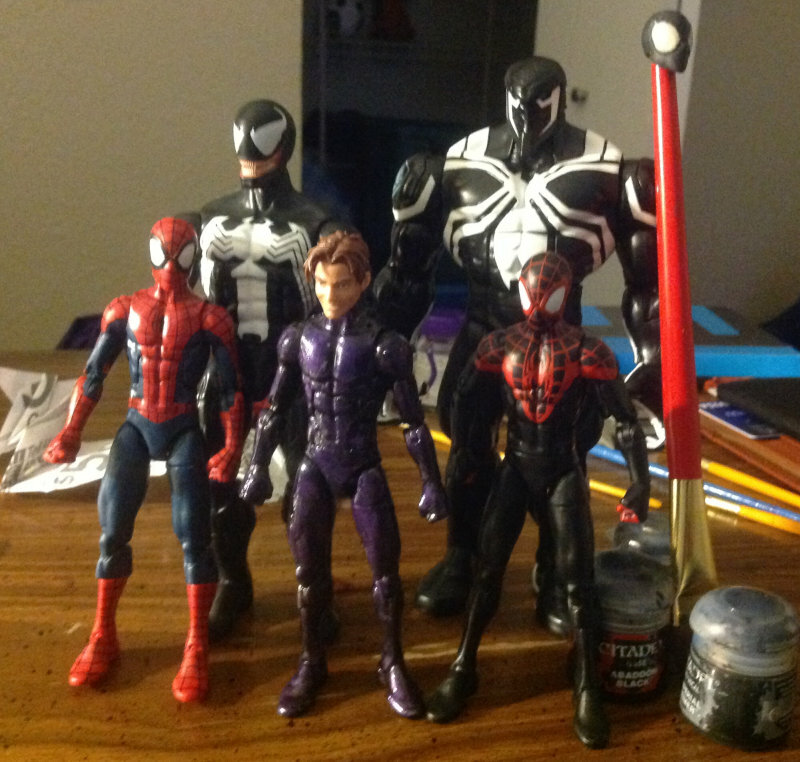 The solution of the Symbiote issue was so obvious that once it hit me I was mad at myself: my Ultimate Spider-Man custom with him in the Black suit. It's purple, which is a color that I didn't have otherwise, it was an important character, and since the Ultimate Symbiote costume is a completely different animal than the 616 counterpart, no duplications. However, it's left a hole in the shelf I now need to fill. Now the list I have is just some of the more likely candidates, but I'm not opposed to others either, just that those are the ones I've been considering most. 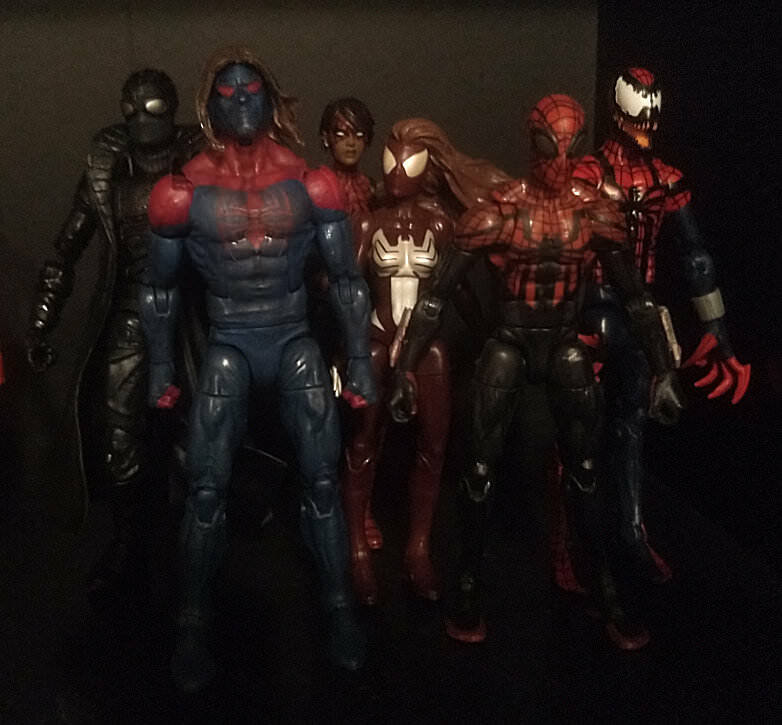 I'm also considering flipping one of the Superiors over to Amazing (either Kaine or Noir) to make room for a second "Superior" aka evil-ish Spider-Man. 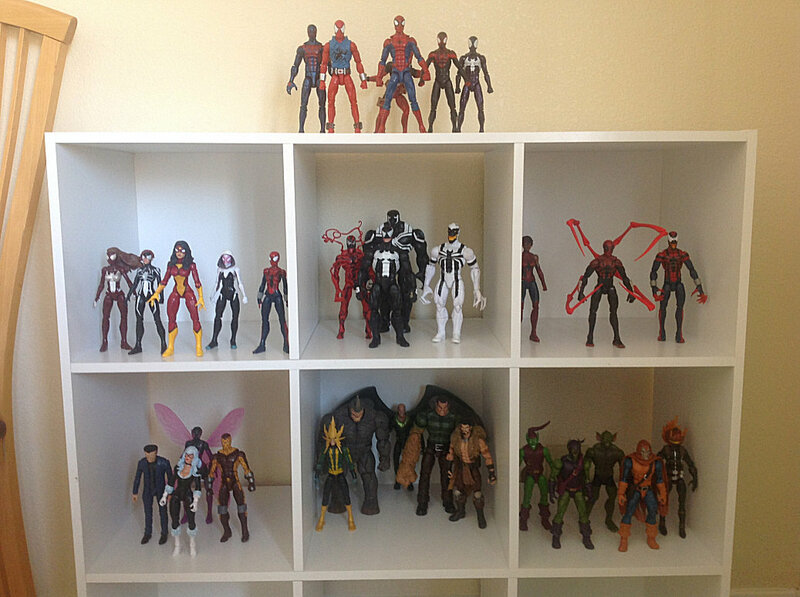 Also, only reason Spiders-Man isn't on the list is because the figure'd be boring. I'll likely post a followup with some micros/renders/something so that those of you who don't know the characters as well can get an idea for them. Not gonna go into too great of detail on these because I have been blowing up the poor FR discord with WIPs, but I am linking the images to another site I posted them at or anyone interested in the nitty gritty. Long Story short: Lots of work for both, but I love how they turned out.